Dublin fans on the Hill in 1984. WHEN MAYO AND Donegal line out at Croke Park tomorrow afternoon, one of the GAA’s most iconic sights will be on view. For over a century, Hill 16 has been packed for the All-Ireland SFC final day and TG4 are set to air an excellent documentary reliving some of its most historic moments. Originally named Hill 60 after a World War I battle which took place in Turkey, the GAA later decided to rename the unique terrace. The documentary was produced and directed by Square One’s Shane Tobin and was commissioned by Rónán Ó Coisdealbha, head of sport at TG4, as part of the broadcaster’s Cogar strand. Tobin said: “I can’t think of a more iconic structure in Irish history and one so interlinked with our national conscious and yet that so much remains unknown. 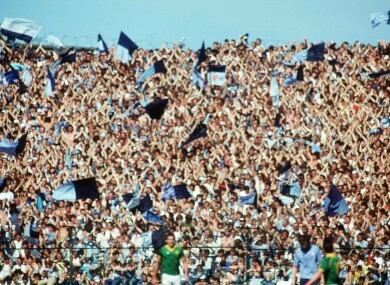 We address the birth of the terrace and its renaming as Hill 16 in the 1930s to the 1960s but most of all we look at the link between the GAA fans and players who make it such a special place especially for Dublin GAA since the 1970s adding the vibrancy and color to it but also placing huge pressure on it as a physical structure”. The documentary will be shown tomorrow night on TG4 at 9.30pm and will also be repeated on Monday at 8pm. Email “VIDEO: TG4 to air Hill 16 documentary ”. Feedback on “VIDEO: TG4 to air Hill 16 documentary ”.